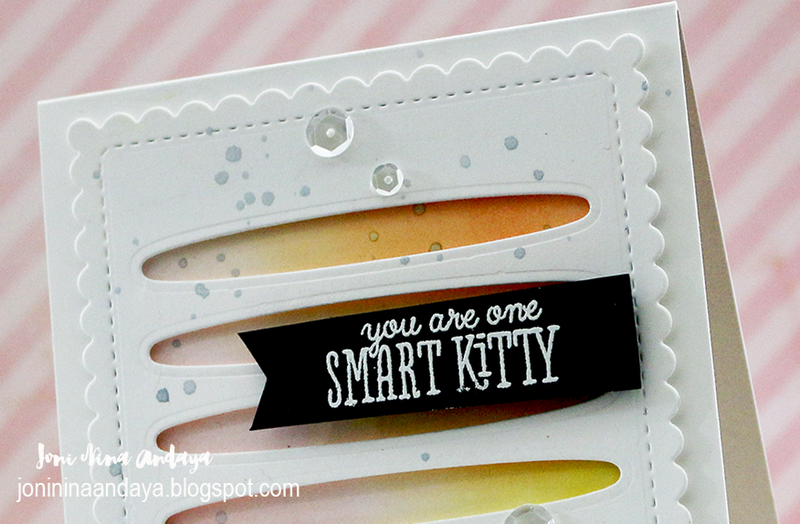 To begin my card I first die-cut the A2 panel with "rug" die from Smart Kitty Coordinating dies. Then I used the scallop stitched from Sunshine Layers die to add a design on the die-cut panel. Next, I distressed the white cardstock card base with Wplus9 ink pad in Beanstalk dye ink, Little Piggy, and Miami Spice to create a colored background. Then I added some splatters using the New Silver Lining Spray Mist, I added a tad of water on the acrylic block to dilute some of the colors to make it a tad lighter, and use my paint brush tool to splatter on the front of the card. 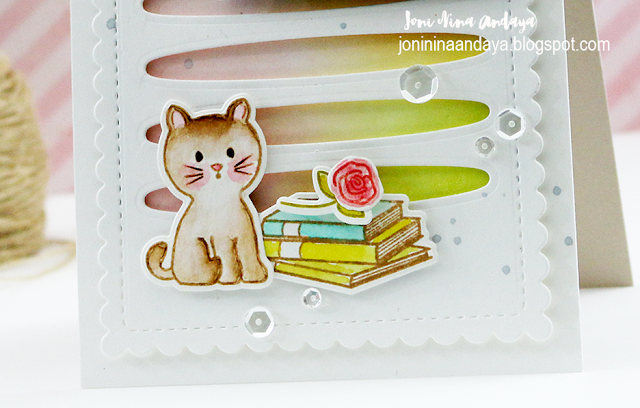 The sentiment I used was also from the Smart Kitty stamp set, I white embossed it on a black cardstock, then adhered on the panel with foam tape for dimension. Next, I watercolored the kitty, rose, stem/leaves, and books, and die-cut each one with its coordinating dies and adhered on the card with foam tape. Then, I added some PPP Sparkling Clear 8mm sequins to finish off the card. I love the background and the soft feel to this card. 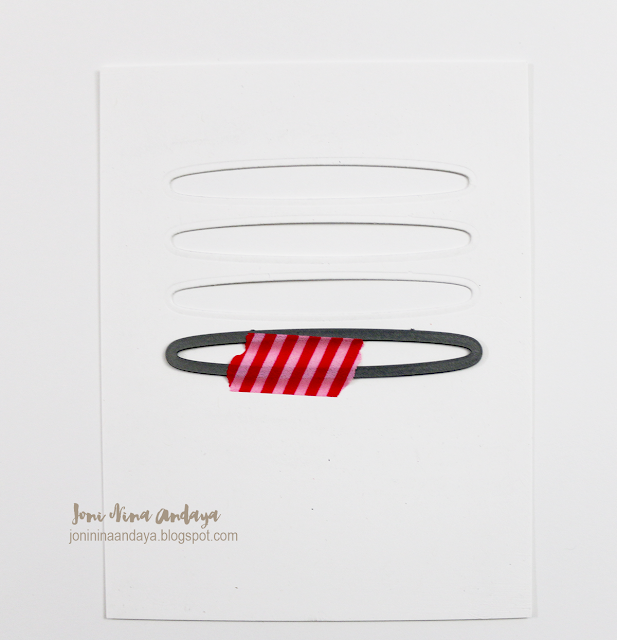 Super cute card, Joni! Love it! What a totally fabulous card Joni ...Love it !! Love love love this! LOVING that diecut background and the adorable kitty!!!!!!!!! Great way to use your die! What a great way to stretch your dies...love the little windows it created! I love the card! So adorable! What a fun idea for your background!! This is fabulous Joni!! Your card is adorable! Love the colours and fabulous design!!!! Thanks for stopping by! I love the fun and creative background you created here, Joni! And your little kitty and stack of books is SO darn sweet!